U.S. Attorney General Eric Holder is leaving after serving six years as attorney general of the United States. He is among the longest serving attorney generals in the history of this nation. Only three others have served longer. It wasn't difficult for Barack Obama and Eric Holder to be in the same orbit. Both were sons of immigrants, Columbia grads, basketball fans and prominent African-American political figures. They first met nearly 10 years ago, dinner guests of a mutual Washington friend who seated Holder next to the newly elected senator from Illinois. On Thursday, Obama announced Holder would be stepping down as his attorney general, one of his longest serving Cabinet members. "This is bittersweet," the president said. 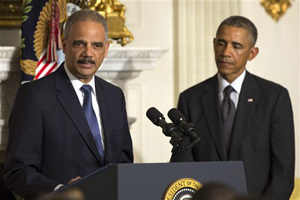 Holder, who will stay until his successor is confirmed by the Senate, was at his side. "In good times and in bad, in things personal and in things professional, you have been there for me," he told Obama. Indeed, over the course of six years on the job, Holder has had his ups and downs. He also has become a rare figure: a close Washington friend of the president. He has also been Obama's point man in the federal response to the racial tensions in Ferguson, Missouri, where a white police officer shot and killed an unarmed 18-year-old African-American last month. "His greatest legacy has been in the areas of civil rights and race," said Carl Tobias, a professor at the University of Richmond School of Law. He said Holder aimed for a frank discussion in the U.S. about issues surrounding race with a dialogue "that intrinsically defies completion and so remains unfulfilled." John Fund and Hans Von Spakovsky, conservative authors of a critical book on Holder, "Obama's Enforcer: Eric Holder's Justice Department," wrote that Obama found in Holder "both a kindred spirit and a heat shield against criticism that would often be directed at the White House." Under his watch, the Justice Department cracked down on journalists reporting on national security matters. The department secretly subpoenaed Associated Press phone records and used a search warrant to obtain some emails of a Fox News journalist as part of a separate leak investigation. The cases created a furor, and Obama ordered Holder to review the department's policies, resulting in tougher guidelines for obtaining reporters' phone records and email. In an interview Thursday, Holder said Obama respected the separation between the White House and the department and let the department "do those things I thought appropriate." He said his biggest regret was "the failure to pass any responsible and reasonable gun safety legislation after the shootings in Newtown." He said he thought the nation would embrace change that was "not radical but really reasonable" on gun safety after the massacre at the Connecticut elementary school. As for the civil rights uproar in Ferguson, Holder said he's not sure whether the Justice Department will finish its investigation into the shooting before he leaves. "I don't want to rush them," he said. Holder and his wife have grown close personally to the Obamas and recently vacationed together on Martha's Vineyard in Massachusetts. Obama said Holder told him over the summer of his timing for retirement. Obama noted that Holder's father was an immigrant from Barbados who served in World War II only to return to a segregated nation. "But he and his wife raised their son to believe that this country's promise was real, and that son grew up to become attorney general of the United States," Obama said. "And that's something."